Armstrong Lazenby first started speed skating at a rollerblading rink and then after getting fast on inline skates he moved to the ice rink. At World Cup level, Lazenby's best result was 29th in the 1500m in Japan in 2012. Competing at the 2014 Junior World Championships in Turkey, he recorded a personal best placing of 21st in the 1000m. 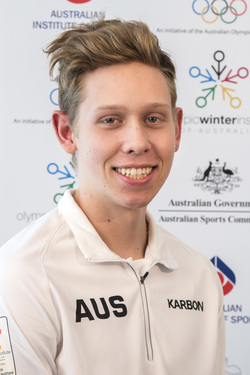 At the 2014 Australian Short Track Championships, Lazenby showed he is one of Australia's leading racers, finishing second in the 1000m and 1500m distances. In 2014-2015, Lazenby matched his previous best World Cup performance of 29th place with the same result in the 1000 metres in Seoul, Korea. I began this sport ... When I was 13 years old I began skating on ice. Prior to ice, I competed in inline skating at a national level from the age of 10. Proudest moment: Second overall at Australian Nationals, two years in a row. 23rd place at the 2014 Junior Worlds. When I am not training/competing I am: Spending time with my family & friends, school work, and social media!